This volume is an essential for kachina collectors. 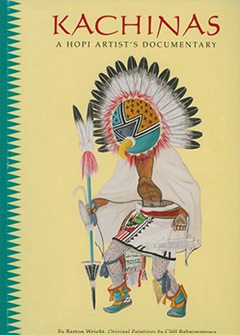 Author Barton Wright is known as the authority on Hopi kachinas and this book (his major work) shows why. It contains descriptions of 255 kachinas, from the most “popular” to many lesser-known and seldom carved dolls. The sketches by Cliff Bahnimptewa are very detailed. Barton Wright was born in Bisbee in 1920. A veteran of World War II, he served in New Guinea and the Philippines. After the war, he graduated from the University of Arizona and began his career as an artist for the Arizona State Museum. He worked as an archaeologist at Town Creek Indian Mound State Park in Mt. Gilead, N.C. and later at an excavation near Tumacacori for the Amerind Foundation. His master’s thesis work was at Catclaw Cave on the Colorado River. Wright spent 22 years at the Museum of Northern Arizona as an artist, museum curator and co-administrator. From 1977 to 1983, he was scientific director at the San Diego Museum of Man. Upon retirement, Wright moved back to his beloved Arizona to continue research and writing. He acquired a vast knowledge of northwestern Arizona, and he held a river pilot’s license for the Colorado River. He was a longtime student of Hopi Indian history and kachinas. A talented painter, scratchboard illustrator and graphic artist, he illustrated many of his own publications. He died in March, 2011. Clifford Bahnimptewa was a self-taught Hopi artist whose home village was Old Oraibi, Hopi Third Mesa. He attended the Phoenix Indian School. It is because of his rich knowledge of his clan and ceremonial affiliations and kachina carvings that his paintings have such authenticity. Bahnimptewa used watercolors and tempera in his kachina paintings which are more dancing performers than dolls. His detail is very fine in color, form and costume. Forty-eight of these paintings were reproduced in Dancing Kachinas, a 1971 publication.